Pammy Blogs Beauty: Makeup Wars: Winter Holiday Nails! Makeup Wars: Winter Holiday Nails! It is time for another Makeup Wars! This time we are sharing some ideas for Winter Holiday Nails. 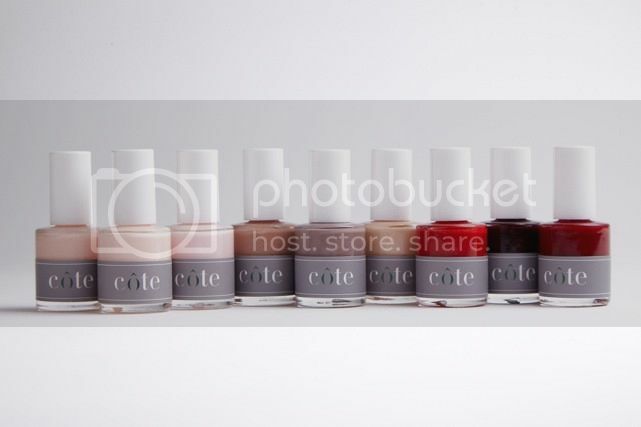 What great timing for this post as I am just wrapping up my Holiday Gift Guide features and wanted to share about an awesome and Limited Edition Nail Polish Gift Set from Côte! While I am new to the brand, apparently I am "late to the party"! This Gift Set was actually featured last year in the December Issue of Oprah's O Magazine as one of her "Favorite Things" of 2014! Well, the great news is that this set was so loved that it is back again this year. It makes a great gift for the nail polish lover in your life (or a sweet treat for yourself!). This specially curated set of nine luxurious, hand-poured, “five-free” polishes which are made in the United States, cruelty–free, vegan, FDA approved and free of the five major toxins associated with nail polishes: formaldehyde, dibutyl phthalate (DBP), toluene, camphor and formaldehyde resin. Including a luscious trio of nudes, a bold trio of red hues, and a fresh trio of neutral pinks. This set comes in a sturdy and sleek box that is perfect for gifting. Nestled inside are 9 polishes in an assortment of colors from light sheer pinks, to subtle nudes, to vibrant reds, you really do get a nice assortment. Almost all of these polishes have a satin finish. If you haven't finished your Holiday Gift Shopping yet, this gorgeous Côte Shop Limited Edition 9-Polish Gift Set is a great option! Do you want some more Nail Inspiration? Be sure to check out my fellow Makeup Wars bloggers' posts by clicking through the thumbnails below! I haven't heard of this brand but the colors look very pretty. Gorgeous set! I've never heard of the brand either, but worth checking out! Drooling over the Trio of Reds!